Winter-Spring 2019 Order form can be found in this Newsletter! 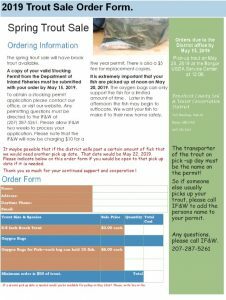 Author adminPosted on March 19, 2019 April 11, 2019 Leave a comment on 2019 Trout Sale Going on NOW! Winter-Spring 2019 You can get the order form here! Author adminPosted on March 19, 2019 April 11, 2019 Leave a comment on 2019 Plant Sale Pre-Order is open!